File under: cool, modern, hard bop, modal. This music celebrates the 100th release of Sonorama, an independent record label from Berlin. Its founder Ekkehart Fleischhammer started in June 2004 with a 7-inch single that features an unreleased track by Swiss piano player Elsie Bianchi. A new cottage industry was born, bringing hidden treasures of modern jazz to international music lovers. Today the focus of Sonorama Records is on unavailable European jazz and American musicians playing in Europe. The criteria Fleischhammer is looking for always is the quality of music, the condition of the source recording, if it is a rarity and the belief that people need to hear that music. 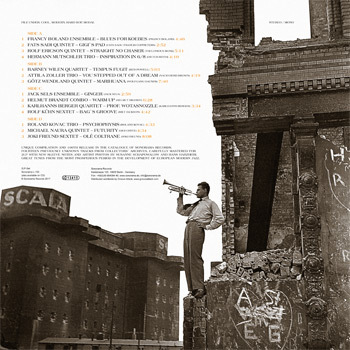 “European Progressive Jazz in Germany 1959-1963” is the subtitle of this anniversary compilation and mainly features a selection of musicians from the Sonorama roster. Most of the tracks presented here are previously unreleased, a few others have appeared on hard to find EPs only. Some of the tunes are live takes, others hail from unreleased studio tapes, all recorded in former West-Germany by some of the best European jazz artists of the time and finally discovered in archives or in the vaults of collectors and musicians. 1959-1963 was the most prosperous period in the development of European modern and progressive jazz. Post-war Europe saw an influx of American jazz artists who felt more appreciated on the old continent. These expatriates brought with them a fresh influence, and European jazz musicians revered their American stage mates. American greats such as Stan Kenton and Lionel Hampton gave their premiere European concerts, creating a jazz-boom. By the late 1950s a new sound emerged as European players gained confidence and started to play and compose in their own style. The fervor for modern jazz was especially apparent in the many crowded jazz clubs which appeared across post-war Germany. The first track of the collection from the Francy Boland Ensemble is the perfect example of this new European sound. Belgian born Boland got his start with Chet Baker before founding his own big band with American drummer Kenny Clarke as co-leader. Boland once explained about his arrangements: “I don’t wanna imitate anybody, I’d like to create something new, something that American musicians have not come up with yet.” The composition “Blues for Koebes” was written for his debut as a leader, a 7inch record. For the front line, he used five reed players from the big band of Kurt Edelhagen, among them Derek Humble from the UK, Karl Drewo from Austria and Dusko Goykovich from Serbia, who all play a brilliant three-chorus solo in the beginning. Another Belgian was vibraphone player Fats Sadi, who had played with the Clarke-Boland big band. On “Gigi’s Pad” he swings hard, in a style that Boris Vian once compared with Lionel Hampton. The track “Inspiration in 6/8” by the German trio of drummer Hermann Mutschler features Dieter Reith on piano, only 24 years old, but already well developed and strong in his playing. That tune was recorded live at the German Jazz Festival in Frankfurt 1962, the same venue as the previously unreleased recordings from Barney Wilen, Joki Freund and the Götz Wendland Quintet. Dieter Reith and Götz Wendland both went on to lead their own orchestras, and both worked extensively in German television. The track here from Wendland’s Jazz combo features a young Wolfgang Dauner playing his composition “Marihuana”. Dauner's heavy chords in the intro foretell not only his success in jazz sessions, but his upcoming impact on krautrock as well. Another successful pianist on the German jazz scene of the late 50s was Michael Naura. His version of Gigi Gryce's “Futurity”, an early hard bop tune made famous in 1954 by Art Blakey, was compiled from the forgotten recordings from a jazz workshop and features the talents of Wolfgang Schlüter, still one of Europe's leading vibraphone players. “Clarinet bird” Rolf Kühn from Leipzig (who chose the opposite solution and emigrated to the U.S. in 1956) used to play frequently with Schlüter upon his return to Germany. Milt Jackson`s “Bag's Groove” was culled from an unknown studio tape produced in 1962, as well as the unique “Straight No Chaser”, a hard hitting version of the Thelonious Monk classic, performed by the Quintet of Swedish trumpet player Rolf Ericson. Both tracks show Kühn on the top of his game. Berlin baritonist and arranger Helmut Brandt and his combo stood out as the most popular German modern jazz ensemble of the late 50s, influenced by the Miles Davis Capitol Orchestra. Brandt`s composition “Warm Up” is previously unreleased and was taped in the jazz club of the small town Rheda - a lost recording finally discovered in the artist`s estate. Paris in the 1950s had become the mecca of modern jazz in Europe. Miles Davis recorded the soundtracks for several films in the French capital with musicians like French saxophonist Barney Wilen, who played with Donald Byrd and also composed and recorded soundtracks with Kenny Clarke. Wilen`s fast version of Bud Powell`s “Tempus Fugit”, a classic from the “Paris Jam Sessions” with Art Blakey, features the talent of Belgian pianist Joel Vandroogenbroeck and remains onknown to this day. Vandroogenbroeck`s compatriots Jack Sels and Fats Sadi recorded “Ginger” for an EP with Senegalese bongo player Ghana M'Bow and American Lucky Thompson. When Hungarian guitarist Atilla Zoller played a late night session at the “Jazz-Saloon” in Berlin-Steglitz - including “You Stepped Out Of A Dream” - he was joined by George Joyner on bass and Buster Smith on drums. Joyner and Smith both had accompanied Eric Dolphy that same day at a TV concert of the “Funkausstellung 1961 Berlin”, later issued as Dolphy’s “Berlin Concerts”. Another unknown reel-to-reel tape had been stored in a huge music library and was recently discovered on a dusty back room shelf: Austrian composer and pianist Roland Kovac got involved in a session with the Quintet of Hans Koller the following year in Munich, and recorded his progressive jazz composition “Psychophysis” in a piano trio format. Flutist Bent Jaedig from Copenhagen played on an obscure 7-inch for a private label with the German piano player Karlhanns Berger, later well known internationally as composer, conductor, pianist/vibraphonist Karl Berger. It is the very beginning of Berger`s recording career and his tune “Prof. Wotasnozzle” is compiled here to reach a few more ears. On the last track, the versatile composer, arranger and multi-instrumentalist Joki Freund pays an excellent spiritual homage to John Coltrane, with Emil Mangelsdorff soloing on flute. It was recorded at a time when these inventors of the formerly cool “Frankfurt Sound” started to move away from solid harmonies and structures, enlivening their music with modal lines, free improvisations and traditional music from around the world. 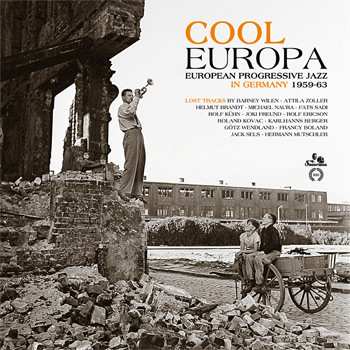 The cover of this album “Cool Europa” comes from the archive of German photographer Susanne Schapowalow. She loved jazz and followed musicians with her camera whenever she could. Trumpet player Fred Bunge was a member of the Joe Wick Orchestra and later played in the Edelhagen orchestra. Schapowalow met Bunge in Hamburg at the Heiligengeistfeld in 1949: “I don’t remember if it was his or my idea to pose up there in the ruins. I was worried because it was slightly dangerous for him, but he looked great playing the trumpet. The two young boys came by on their wooden carriage and stopped to listen. The whole situation was improvised.” After the end of the second world war, this picture seems optimistic. The two boys symbolize the post-war generation and Fred Bunge was very much into progressive jazz, but he missed the blossom of that period. He died in a car crash in 1960, only 36 years old. Another German photographer, Hans Harzheim contributes several portraits here. Harzheim has produced an impressive body of work and captured many jazz greats. Once again, Sonorama Records has unearthed some excellent unpublished tracks here that will satisfy the serious connoisseur. Fleischhammer explained in an interview for the website “All About Jazz” what Sonorama is looking for: “It must always touch me in a spiritual sense, and be of historical importance regarding the repertoire of the artist. Even better if it can close a gap in certain fields of music that people, or especially the record industry forgot about.” These rediscovered recordings are perfect to celebrate the 100th release of Sonorama. compiled for Sonorama Records by Ekkehart Fleischhammer. This release is dedicated to all the wonderful musicians.